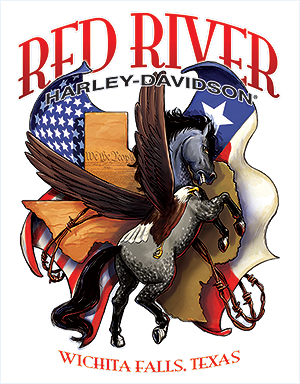 For over 114 years Harley-Davidson® has been inspiring freedom, revolution, rock'n'roll, and over-all sanity and since 1985 Red River Harley-Davidson® has proudly been bringing these feelings, thoughts, and ideas to the Wichita Falls area. Not only do we believe in these ideals whole heartedly ourselves but we "live and breathe" them as we ride together with our customers building and carrying on that strong family bond that we build with one another as we all together and individually become a part of Harley-Davidson® and the Harley-Davidson® Lifestyle. Here at Red River Harley-Davidson® we LOVE what we do! Riding is our LIFE and we cannot wait to share that passion with you! From the old days in our small store up the hill to our new moderinized dealership, we are committed as ever to deliver the best product and service. We are not working to be the biggest Harley-Davidson® dealership, just THE BEST! RRHD is not just another dealership. We are family owned and operated since 1985 by a family that lives and breathes Harley-Davidson®. In 1985 Jim & Vickie Gilmore opened Red River Harley-Davidson® and not a day has passed since that they have not been emerged in the Harley Lifestyle, instilling those same H-D values of riding freedom in their children, who both work at the dealership and are both avid riders. Check out our Events page and join us on our next ride! It is through all these many personal connections as we blaze our path together and also our continuous involvement in the local scene that we do our best to be a responsible member of the community and give back with our involvement with different organizations throughout Wichita Falls; From Downtown Development, Sponsoring of the Wichita Falls Nighthawks, and our involvement with The Friendly Door in Iowa Park to our weekly RRHD® Cook-Outs that we host at our dealership every Saturday in the Spring and Summer for donations to go 100% directly back to those local organizations. We love our role in the Wichita Falls community, providing a place to fulfill dreams of personal freedom, as we both live and grow together. 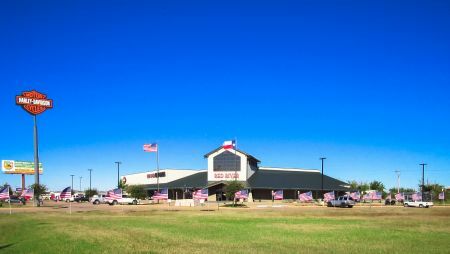 Located on the West side of the property you will find our Riding Academy training facility, declared by several MSF and Texas DPS Motorcycle Safety representatives as one of the best ranges they have seen or worked. When you see our range and our store, you will understand our commitment to providing a quality experience at Red River Harley-Davidson® . Since the move in 2007 to our huge 38,000 square foot facility, our goal remains the same; making each customer feel like they are the only customer we have. From our Service Department to Parts to Sales, we all ride with you. Come see the difference in a family owned dealership.